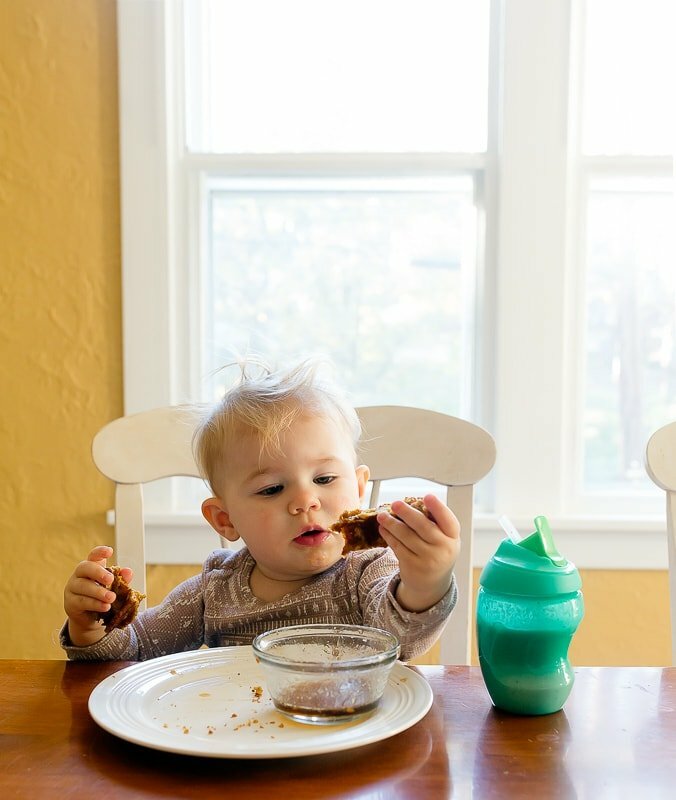 Pumpkin waffles for baby and toddlers! 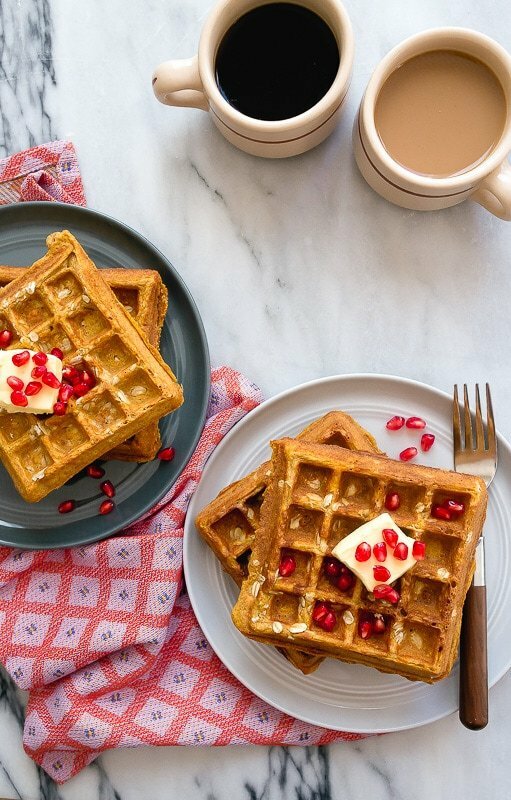 Naturally sweetened, whole grain pumpkin waffles made with whole wheat flour and dairy-free! I really really wanted to call this ‘baby’s first pumpkin spice latte,’ but because I can feel your eye rolls from over there, I didn’t. But I did douse this whole wheat pumpkin oat waffle batter with a full tablespoon of pumpkin pie spice. I will not confirm or deny that Camille steals a sip of my (decaf) coffee in the mornings. Basically, what I’m trying to say is: my baby and I each drink a grande Pumpkin Spice Latte every morning at Starbucks and talk about Gilmore Girls. (I’m kidding). 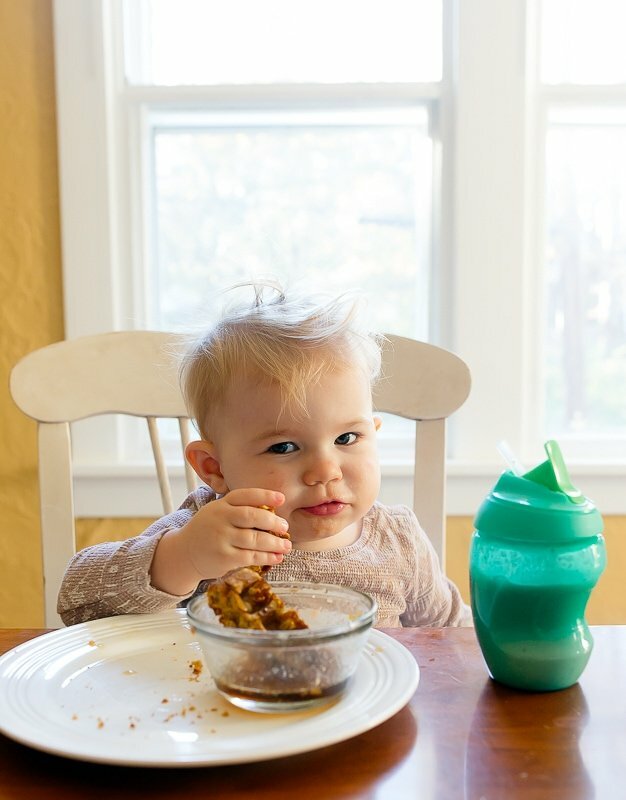 I stopped sharing a lot of baby food recipes. Judging by the emails, you noticed. Sorry about that. Anyway, save for a few batches of homemade graham crackers, Camille eats exactly what we eat, with some extra fruits and vegetables thrown in at snack time. I’ve been having this problem with oats, though. I made her too many oatmeal + fruit puree breakfast combos when she was a baby, and now, she will hardly touch oatmeal. I over-did it. Bad Mama. So, now I’m always trying to sneak oats into her life. I came up with this pumpkin waffles recipe when I noticed Heidi had a recipe for whole wheat waffles in her latest book, Near and Far. This is a very loose adaptation of her recipe. I plopped in pumpkin, coconut milk instead of buttermilk, and did I mention the pumpkin spice? Oh, I did. You can eat these, too! I like to slice the waffles into sticks, and help baby dunk each stick in maple syrup. These waffles lack sugar, because I had a feeling the dunking in maple syrup part was going to get excessive (and it did). 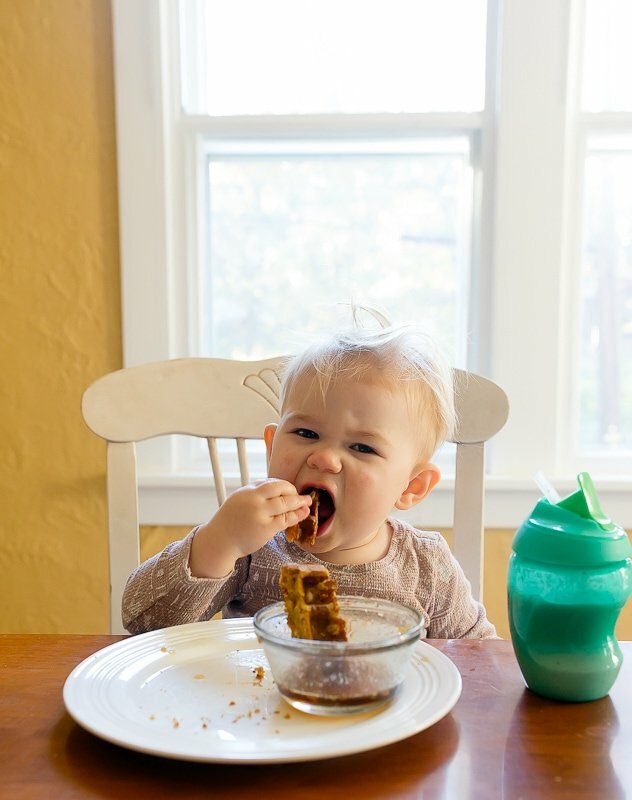 It’s a good idea to let your kid dunk in syrup while limiting sugar in the actual waffle. They’ll get plenty in the syrup bowl. When I was growing up, my mom always melted the butter into the maple syrup, and it seems absolutely ridiculous to me why you would do it any other way. Does anyone want to talk about what it’s like having a blond haired, green-eyed child while both you and your husband have brown and brown? Anyone? Just me? K. Thanks. This recipe makes 8 large waffles. I slice them into sticks, lay them flat on a baking sheet and freeze. Once they’re frozen, then you can pile them into plastic bags for long-term storage. Camille is 19 months old, and usually eats 2 sticks at breakfast. 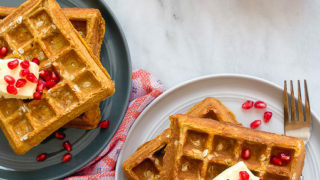 I hope you love these pumpkin waffles! 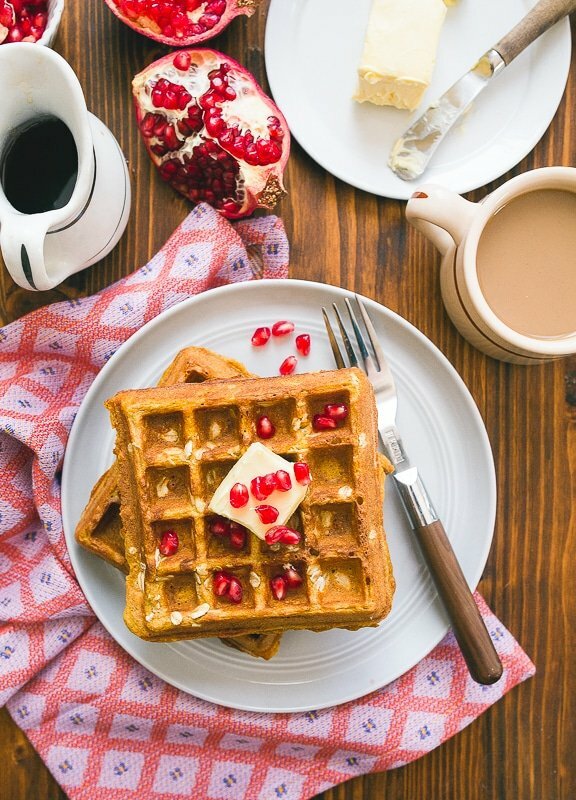 Healthy whole wheat waffles with pumpkin and oats. In a large bowl, whisk together the flour, oats, spice, cornstarch, salt, baking powder and baking soda. Set aside. In a small large bowl, add the egg whites and whip on HIGH speed with an electric mixer until soft peaks form. Set aside. In a separate large bowl, add the egg yolk, pumpkin, coconut milk, vinegar and melted coconut oil. Add the pumpkin mixture to the dry ingredients, and whisk until combined--a few lumps are fine. Finally, fold in the whipped egg whites carefully to not deflate. Ladle about a 1/2 cup of batter into your waffle iron, close and cook until done. Repeat with all remaining batter. Haha! My brother is also blonde and blue-eyed while me, my mom, and my dad all have brown hair! But both of my parents said they grew up with lighter hair and it darkened with age, so it kind of makes more sense for him, though he never outgrew it! Can you make pancakes w this recipe? I don’t own a waffle iron ~~ thanks! Just curious, what is the corn starch for? Adding these to the list of foods to make Teddy. He has started eating what we eat as well, but I still like making things “special” for him with a little more nutrition than we have on a day-to-day basis. I love that these are healthy for baby, and delicious for me. ;) Camille is such a cutie! I’m the unexpected green-eyed blonde in my fam. My mom has brown hair/brown eyes, dad is a red head with blue eyes. My brother is blonde with light blue eyes, my sister has brown hair and dark blue eyes. We’re a circus. My own kiddos have brown hair and brown eyes, just like their dad. His side of the family totally followed the rules of dominant/recessive genes. Your little Camille is a doll!